For the complete APES WEEK INDEX of stories, click here. Producer Arthur P. Jacobs had a vision. That vision was to take Pierre Boulle’s 1963 novel (which the author himself dismissed as an inferior work) and turn it into a sci-fi epic. Most of the studios in Hollywood turned Jacobs down, even after he had acquired mega-star Charlton Heston to play the lead. Then, thanks to some box-office successes at 20th Century Fox, Jacobs was able to convince the powers that were to sign on. That would be a good move of epic proportions, one that is still paying dividends for the studio to this day. Jacobs hired The Twilight Zone’s Rod Serling to write the screenplay, which was then rewritten by former blacklisted screenwriter Michael Wilson. Wilson dropped Serling’s expensive-to-produce notion that the apes lived in a futuristic society (which in turn was taken from the novel), and decided to have the world be a primitive one. He did, however, retain Serling’s blockbuster ending. 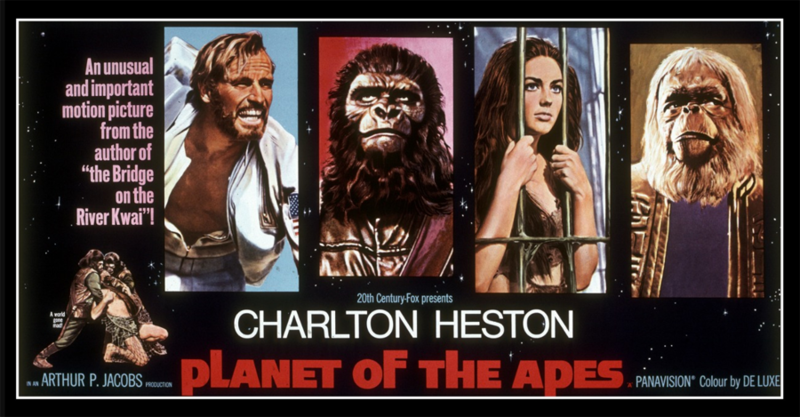 With filmmaker Franklin J. Schaffner at the helm (who had previously worked with Heston on The War Lord), Planet of the Apes takes viewers effortlessly into its far-off world. Heston plays Taylor, one of four deep-space astronauts, and as the film opens he is preparing to put himself into hyper sleep. Taylor is not the standard All-American Space Hero seen in dozens of previous sci-fi movies. Rather, he seems perfectly delighted with the idea of getting away from all mankind, even if he has no idea what lies ahead. What does lie ahead, of course, is a planet run not by men, but by apes, a piece of information revealed to us in one of the most exciting, shocking sequences the genre had ever seen, aided immeasurably by Jerry Goldsmith’s unusual, unforgettable score. Movie audiences were not used to seeing CHARLTON HESTON—all caps—being this out of sorts, this off his stride. Taylor barely has time to take it all in before he is shot in the throat, knocking him out and rendering him temporarily mute. 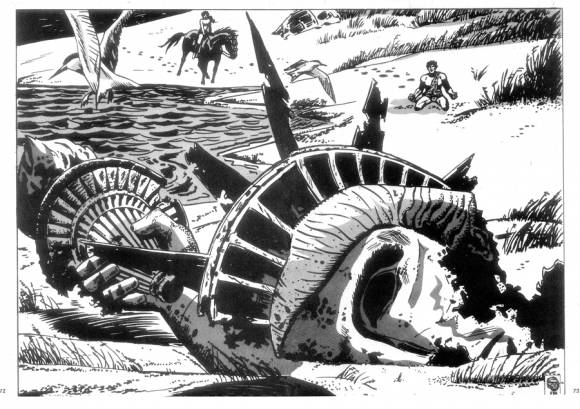 Planet of the Apes is one of those movies that defied the odds, where every creative aspect was executed flawlessly. The acting, the music, the pacing, John Chambers’ groundbreaking make-up effects: All of it falls together like a jigsaw puzzle snapping into place. Heston’s Taylor goes from humanity’s harshest critic to its lone defender, while trying to figure out which apes he can trust. As discombobulated as we are, the film doesn’t spare the apes either: When they hear Taylor utter his unforgettable directive for them to take their “stinking paws” off him, we know the Planet of the Apes will never be the same, either. Planet of the Apes was a massive success, the kind of movie that appealed to virtually everyone: plenty of amazing visuals and action for the younger crowd, with a trenchant social message that appealed to an America mired in civil unrest and an unpopular, immoral war. And despite the film’s ending (possibly the greatest final reveal in all of cinema? 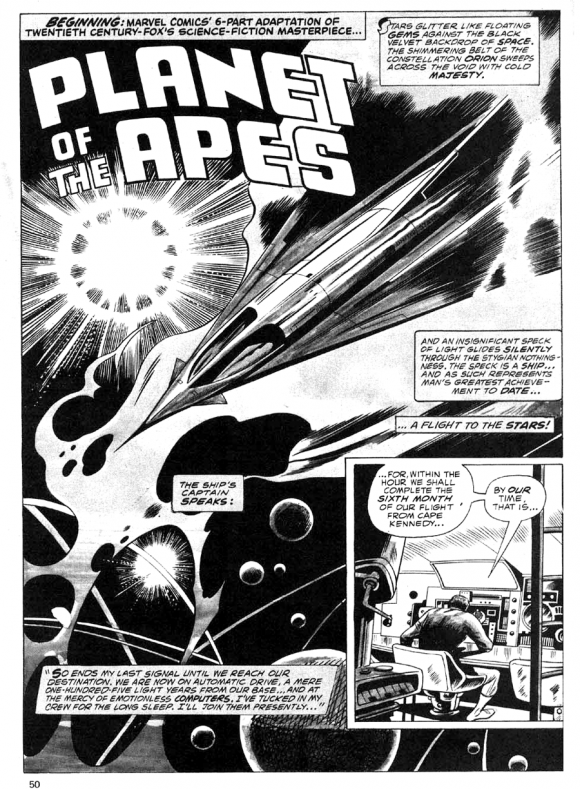 ), the minute 20th Century Fox and Arthur P. Jacobs saw the receipts, they knew they needed more Apes movies, pronto. We’ll be discussing the subsequent Apes films later this week, but let’s jump ahead to 1974. The movie series had wrapped up, and now had moved to television. 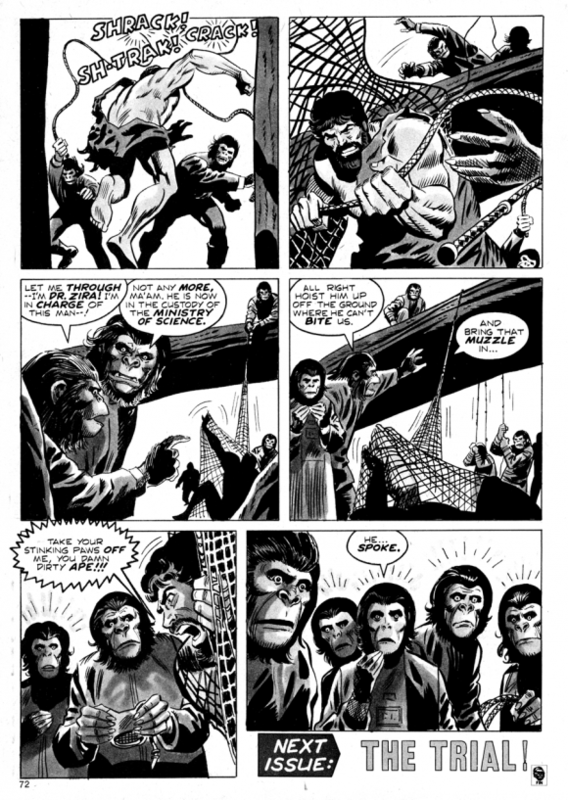 Marvel Comics bought the rights and launched the black-and-white Planet of the Apes magazine, featuring a mix of new adventures, behind-the-scenes features, and an adaptation of the first film. Written by workhorse Doug Moench and drawn by George Tuska and Mike Esposito, Marvel’s film adaptation was broken up into spread segments across the magazine’s first six issues. 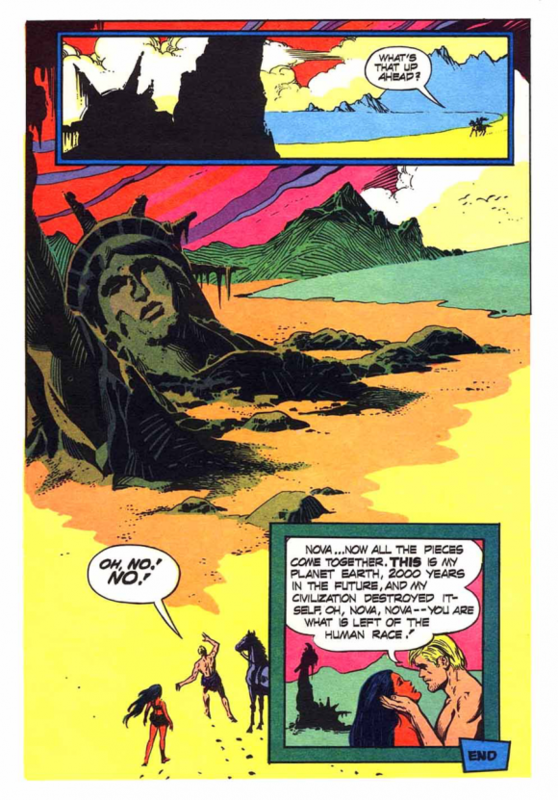 (The adaptations continued with the next films; the original and Beneath were also reprinted in color in the standard-size Adventures on the Planet of the Apes.) With almost a hundred pages of space devoted to the adaptation, Moench is able to hit all the major plot points and themes of the film. (Marvel refers to it multiple times as a “science fiction classic” and even though they used that for every property they bought, in this case it wasn’t hyperbole.) Not owning the likeness rights to Heston, the Marvel Comics Taylor rocks a big bushy beard, but he’s the same misanthrope we saw on the big screen. Tuska’s cartoony, clean line lacks some of the earthy grit of the films, but he was great at action. Marvel did feel the need to revamp certain scenes, like when Taylor learns what happened to his fellow astronaut Dodge. In the film we see him turned into a stuffed figure in a museum exhibit, while in the comic his head has been mounted, trophy-like, on a wall (gruesome). And it doesn’t quite stick the landing, moving the Statue of Liberty so that it is laying on the ground as opposed to sticking, mock triumphantly, out of the sand. But overall the Marvel version works pretty well, and the reader can’t help hearing the distinctive voices of Heston, Roddy McDowall, Kim Hunter, etc., when reading the dialogue. 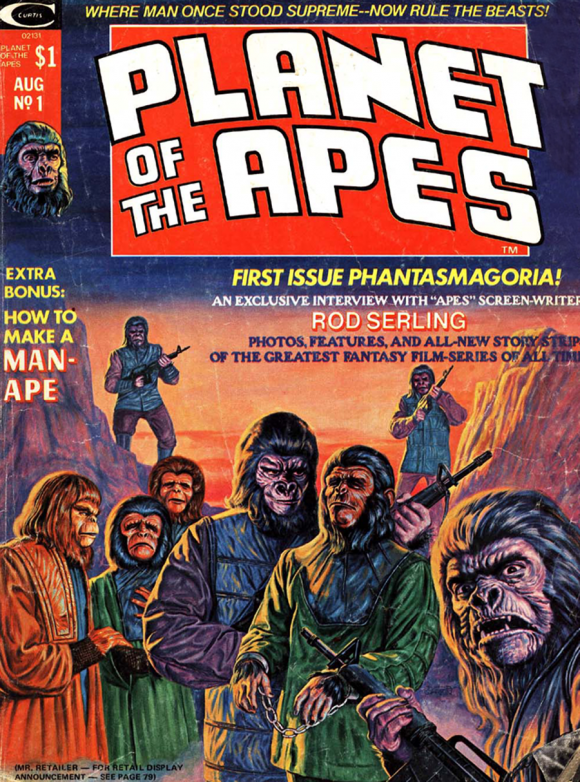 Speaking of voices, Peter Pan Records produced their own comic book version of Planet of the Apes, to read along while you listened to the record. Naturally, it removes the most violent moments of the movie altogether, while still keeping that immortal final scene (although their version of Taylor seems to take it all in stride). NEXT: Beneath the Planet of the Apes. Click here. Rob Kelly is a writer/artist/comics and film historian. He is the co-host of Aquaman and Firestorm: The Fire and Water Podcast, the host of The Film and Water Podcast, and the host of TreasuryCast. He’s one of the Blessed Vegetarians.